Verticals, organizations with a large quantity of specialized properties in their portfolio, can use benchmarking and benefit in a number of ways. Verticals are usually large organizations that have multiple facilities of similar types that can be benchmarked comparatively. They could have multiple data centers, retail centers, offices, hospitals and many more. Verticals exist in nearly all industries such as healthcare, financials, retail, manufacturing, etc. In last month’s article, we introduced the concept of benchmarking verticals, and then provided a detailed example for Janitorial services. This month, we will look at benchmarking Utilities for the Manufacturing vertical. 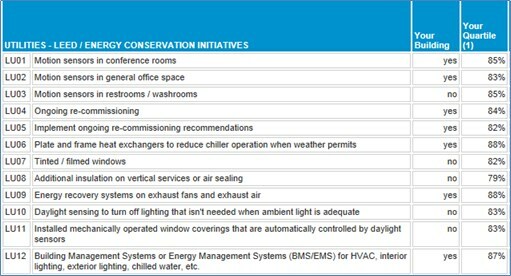 The largest facility operating costs are almost always in the energy-utilities or maintenance areas. If either of these areas hasn’t been carefully benchmarked in the past year or so, it is also one with the highest potential for savings. Buildings shown in Yellow belong to the client’s organization; other buildings represent others tracked in the benchmarking database. Figure 1 allows you to see at a glance how your facilities compare with other manufacturing facilities. 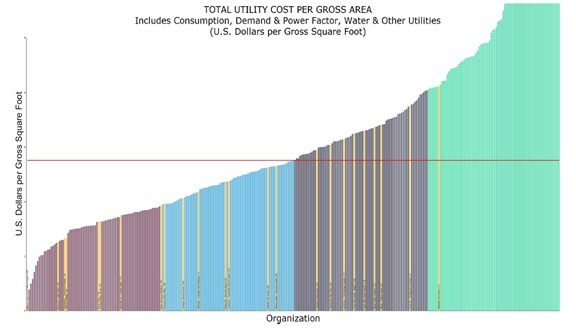 There are 315 buildings in this peer group with a median utility cost per square foot of $2.76 and a first quartile performance of $1.88 per square foot. The yellow bars indicate the manufacturing facilities in the benchmarked vertical. Note that most of the facilities are in the first and second quartile, but there are eight facilities in the third quartile with one facility in the fourth quartile. By looking at and comparing similar types of facilities, you will be able to make intelligent “data driven” decisions that can improve the performance for all the benchmarked facilities. To reach first quartile, or move the high-cost facilities into the second quartile you could begin looking at the best practices that the 1st implemented and hold focus meetings about which best practices have the highest return. Figure 2 shows some of the best practices that have been implemented by the first quartile group, and whether that practice has or has not been implemented by the Subject Building being studied. This is only a partial list (there are about 30 best practices overall). Using the results from this table, the facilities group can make proven recommendations for utilities services that would help achieve first quartile performance or move toward first quartile performance. Again, this is win-win for both the entire organization. The company will achieve cost savings from the utilities improvements and improved levels of service; the FM will improve the company’s profitability by more effectively utilizing its workforce, and there will be improved occupant satisfaction which benefits everyone.